This week has been huge for Oregon fans everywhere, but it may have been even bigger for students. YES, we destroyed FSU in the Rose Bowl and are now moving on to the National Championship in Dallas, but that wasn’t the only reason to celebrate for many at the U of O. 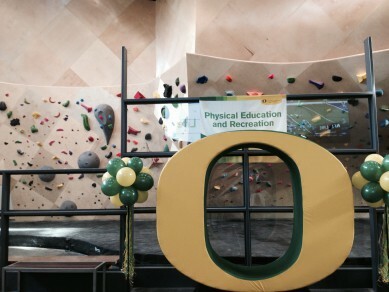 On the evening of January 4th, the new Oregon Student Rec Center became open to the public. After 12 years of planning, 16 months of construction, and much anticipation from students, the facility was finally unveiled. After using the old gym for three and a half years now, I can confidently say that the old rec center was severely underwhelming. At a school where nearly every athletic facility and many educational departments are state of the art, the workout facilities for students offered nothing to look at twice. The weights were old, the track was unforgiving, machines were constantly being treated for maintenance, and the pool was mediocre at best. The only decent parts of the old rec center were the front basketball courts, and a relatively new back gym that was about a third of the size of the main building. At last! A student rec center we can all be proud of! The new addition increases the square footage of the building by 110,000, bringing the total area to 280,000 square feet, almost twice as big. Good thing, considering the old rec center was designed for about 2,500 students’ use, while between 4,500 and 6,500 were actually using it on a daily basis. Many students, including me, complained about overcrowding and inability to get access to machines. In the season of new year’s resolutions, the Rec will undoubtedly be crowded for a while, but the renovation creates enough space to provide equipment for everybody. But not just any equipment. Brand new equipment. The new setup has an entire floor devoted to cardio machines, and another floor with top of the line free weights. Anyone who ever lifted weights at the old rec center can attest that the free weights were some of the rattiest things ever. All-metal, chipped paint, smelling of sweat and B.O., they were utterly atrocious. While the top floor is designated for cardio and the main floor is for weightlifting, the bottom floor may have the nicest addition of all. Also known as ”downtown,” the lowest level has a new, 12-lane swimming pool complete with diving boards and handicap accessibility. About 15 feet removed from that pool is a full-sized recreational pool with a basketball hoop and volleyball net for those more pool-party inclined. Nestled into the edge of the recreation pool is a 16-person hot tub as well. Perfect for winding down a workout or relaxing with friends. Another cool addition, visible from the first step into the main entrance, is an extension of the giant rock wall for climbers. The left side of the atrium grabs immediate attention, with people swinging back and forth from rock to rock on the colorfully speckled, tan mass of wall. 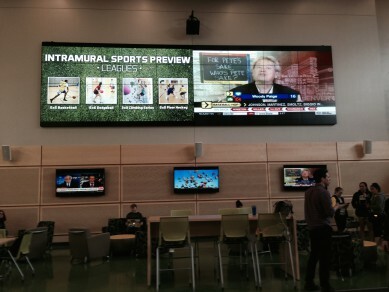 Just a half turn right from the wall is a giant, 32 panel TV screen, displaying sports highlights and upcoming events at the rec center. The entrance is extravagant to say the least, but what else would you expect from such a beautiful campus? I wish my TV at home was this cool. The addition comes on the heels of a series of new projects on and off the U of O campus. New dorms called “Global Scholars” were put in two years ago. Student apartments off campus are growing at crazy rates to accommodate the influx of people attending the university. The new football performance center had people around the country turning heads. 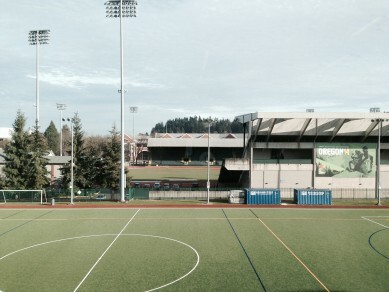 Matthew Knight Arena and PK Park both opened less than five years ago. The only thing missing was a facility that could be appreciated by athletes and students alike. While the Ducks are known for special treatment of athletes (Thanks, Uncle Phil. ), non-athlete students deserve special treatment as well. They make up the heart and soul of any university and should be treated as such. Suffice it to say the renovation will be more than enough to pacify many eager, young college students trying to get a workout in. It appears the University of Oregon’s new year’s resolution might have been to give something back to the students who have made it what it is today.